That was a tough one and gonna hurt for awhile. Although a win Saturday would be a good salve. A lot of big plays a calls. But I think one that could be overlooked was TA missing the front end late. I think we had a 3 point lead. He makes both and we're back up to 5, stop the bleeding, and maybe we hang on. Instead it was the dreaded and familiar feeling of "uh oh, here we go". I called game when he missed it. Might not be fair but it was pretty big. That might have just punched Palmer's ticket to Europe for his future basketball. Just plain frustrating. The curse of being a Nebrasketball fan. This loss doesn't ruin the season by any means, but if you want to finish in the upper echelon of the league, you typically have to hold serve at home and pick off a few wins on the road. This game was certainly one that, prior to being played, was a prime opportunity to get one of those road wins. faith in the bench or we are going to run into this same problem several more times. This seems a bit premature. I agree, it was a bad night for JPJ and this really continues a trend of a very up and down campaign for him. However, I don't think we should write him or the team off. He does need to shake out of this funk and be much more consistent though. I actually think he let his defense, or the fact that Coffey was eating his lunch, zap his offensive energy. This usually goes the other way but JPJ clearly seemed to be affected by what Coffey was doing to him. Probably just a lot of frustration. One positive takeaway I'll have from the game is how much more aggressive Roby was. He was assertive and looking to score. We need an aggressive Roby to keep the defense honest and his length and quickness should allow him to take bigs off the ball and convert at the rim at a much higher percentage than he did last night. I'm ok with the 3 missed threes. At least 2 of them looked good to me and once those start falling at a reasonable clip (say 30%), he will be close to un-guardable for most teams. I think this was a very positive sign for this team and it's continued improvement going forward. With Roby hopefully continuing to be assertive, one game soon we will have Watson, Palmer, Copeland, and Roby all firing at the same time and it will be beautiful to watch. Hopefully Saturday! Plus we need to sub earlier, as we can't have Amir or Brady in at the end of the game due to free throw shooting. Zero adjustment to Coffey is bad enough.. But they couldn't guard Copeland all night, he was drilling litterally everything he was taking ouside 5 feet and he doesn't get one shooting look in the last 4 minutes. Really Tim? Exactly...I can't believe we don't get Copeland the ball at the end of games. Hell, more during the game. He is money from deep and mid-range off of a turnaround. He can pump fake that and get to the rack as well after he drains a few. Copeland needs to be getting the looks in crunch time. What other team has rim protectors when all of their big guys are out with foul trouble? At least I enjoyed the first 3/4 of that game. Wish I had gone to bed then. I would have slept better. Sighhhhhh. Should not have lost that game. I am one bummed out dude right now. Lack of depth remains our biggest weakness. Tired guys get beat off the dribble, reach and pick up fouls and lose their legs on jump shots. It's not all physical either, sometimes a guy just needs to be taken out to refocus. We all like our backups individually and hope they improve, but collectively it's a weak bench. Nine more road games left in the conference. Nine more chances to pick up two or more wins. Hold serve or go 9-1 at home, and we're good. The missed goaltend to start there run (cut it from 10 to 8 ) and than the missed shot clock violation that would have given us the ball back down one score were both egregious misses and I believe both could easily be reviewed??? Sad night for the huskers down the stretch and a sad night for the refs. Thought the first call on palmer on the break was garbage. SHould have easily been Coffey's 4th. Thought Roby's 5th on the rebound scramble was incredibly soft for the game being on the line loose ball type of play. Whatever- on to creighton. Two HUGE GAMES coming up in the next 8 days. 2. That being said, they are not good. They are a bottom 4 Big 10 team. 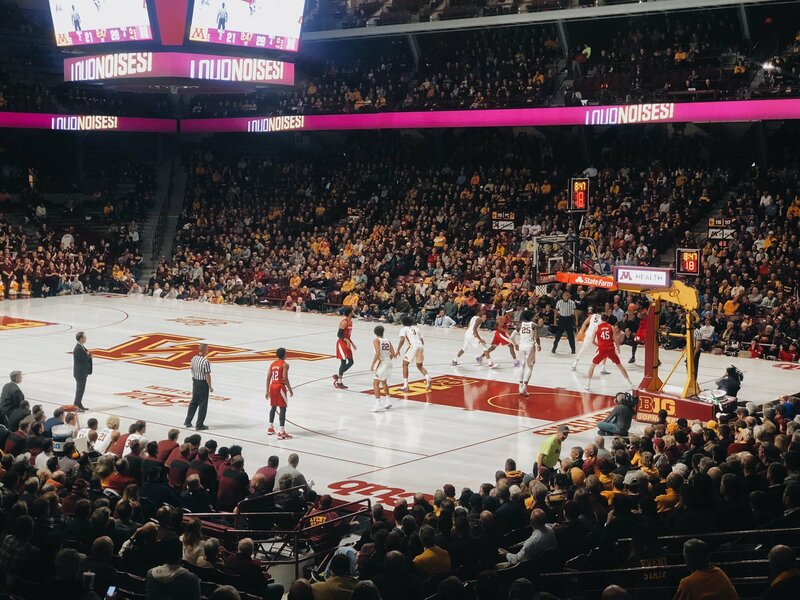 You really think Minnesota is a bottom 4 team? Dang... I sure hope not. Right now they are projected to finish 11th. That’s a team we should smoke at home hopefully. - The Kalscheur "chicken wing" on Watson because no one is really looking for Kalscheur to push off and Watson isn't trying to defend by falling over. Palmer has the offensive foul stink on him so defenders will look to fall over and he has to correct. 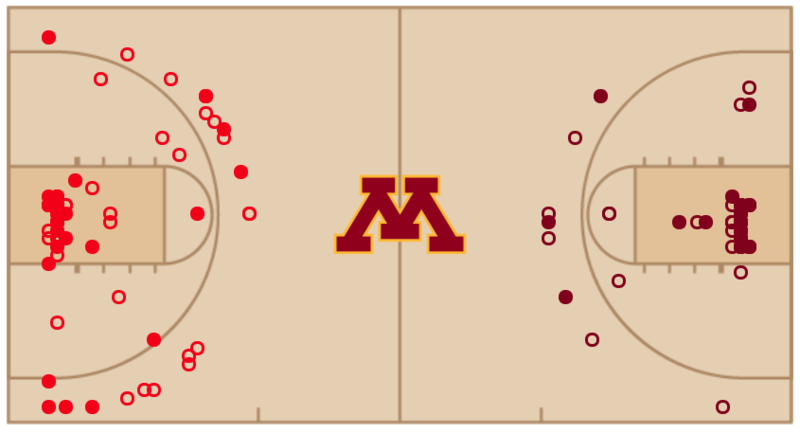 - I'd forgotten about the steal that Watson got and when trying to save it the ball ended up going back to the Gophers with numbers instead of a breakaway dunk for us. Big 4 point swing there. When we're talking about not putting the game away there is 4 gifted points from the technical FTs and the goal tend. We lost that game because they blew past us on their home court, not because we aren't the better team. Better teams lose sometimes. And although it shouldn't have happened last night, members of the bottom half of the league are going to win a few games — likely at home — against members of the top half of the league. Hold serve at home or go 9-1. Let's learn and turn the page. Cretin has been sitting at home all week watching other people play. They should be fresh. The Huskers need to regroup, and the home crowd will be needed to provide some energy. Beat the hell out of Cretin!